The R-Space is powered by a 900cc engine with the performance of a 1.6-liter unit. Renault unveiled the R-Space minivan concept at the Geneva auto show. The concept is the third design study that shows the automaker's new styling philosophy. Laurens van den Acker, Renault design chief, said the new styling direction is a core part of the company's "Renault 2016: Drive the Change" strategic plan. "Sometimes it is necessary to engineer breaks with the past," Van Den Acker said during a Tuesday press conference at the show. The R-Space shows a vehicle aimed at young familes and has styling hints for the successor to Renault's Scenic minivan. The front seats emphasize driving performance, while the backseat area can serve as play area for children. The concept also previews a new range of downsized fuel efficient engines that Renault will begin launching on the market next year. 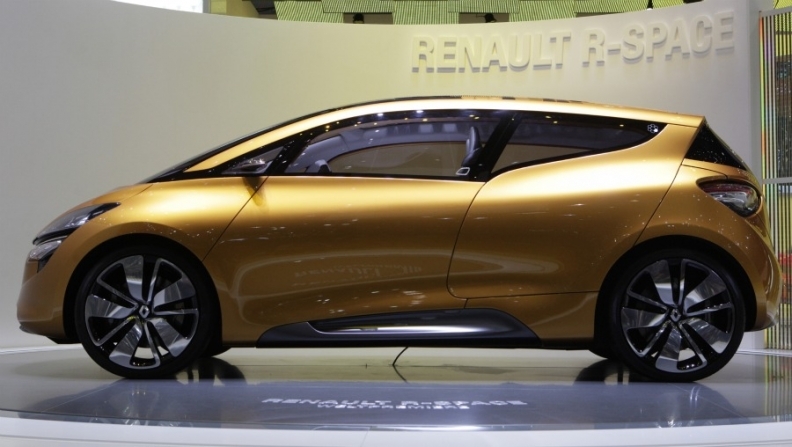 It is powered by a 900cc, three-cylinder gasoline engine that Renault says has the performance of a 1.6-liter engine. Renault also unveiled the Captur crossover concept at Geneva. The Captur is the second design study with the company's new styling cues. The DeZir sports car concept unveiled at the Paris auto show in October was the first study showing the automaker's new styling. "DeZir was about our customers falling in love. With Captur, they explore the world and with R-Space, the time has come for them to start a family," van den Acker said.